There’s an illustrated drawing of an inventor with some of Leonardo da Vinci’s more famous works on the front cover. The artwork catches the eye, but doesn’t offer any clues as to what the game is about. 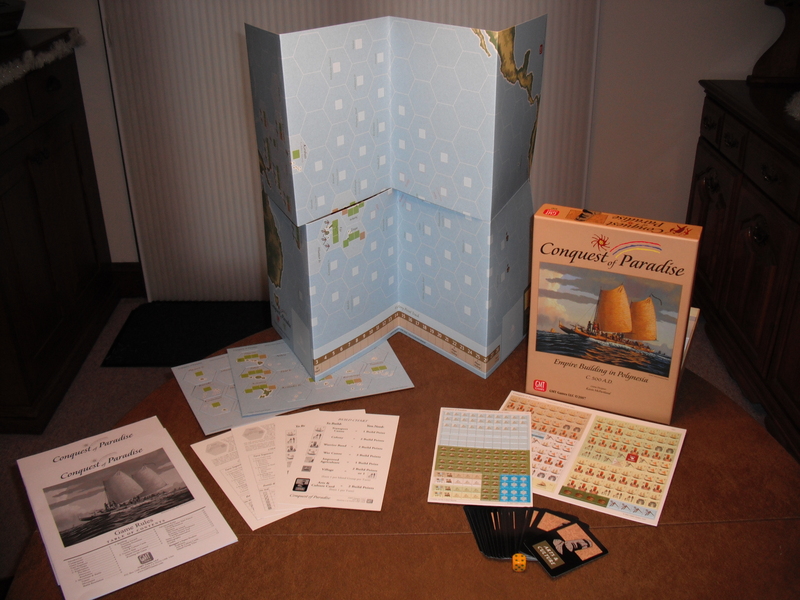 The back gives a brief description of the game and lists the game components. The box is a bit flimsy, not as thick as some of the other games I own, but adequate. A mistake? Nope, just the designers being clever. After opening the box and pulling out some components I notice a manufacturing error… oops! Or so I thought. It seems the designers cleverly added a molding of the name “Leonardo” into the insert in mirror writing – just the way Leo would have actually signed it. Besides being clever, the insert does a good job of holding all of the components with a larger area to store all of the bits. Included are plastic bags to hold them, but only 3 bags. I added a few more to make 6: 1 each for the five player colors and 1 for the other bits used during play. The game board is illustrated in the a similar style to the box cover and is interesting to look at. Unfortunately, all of the artwork is covered by boxes that hold the invention cards, resource cards, money cards (florins, of course), and other components. While playing the game you never get to look at the artwork. I’m sure the artist was a bit disappointed all his hard work would just be covered up. The player tokens are fun. Each player gets one Master token and 9 Apprentices. The 9 apprentices remind me of meeples from Carcassonne, but with more pleasing, human-like proportions. The Master dwarfs his apprentices in size and wears a hat and robe. They are wood bits painted red, green, yellow, blue and purple. Not my ideal choice of colors, but they aren’t too difficult to distinguish. There are also some other plain cylindrical tokens (in the player colors and brown) for keeping track of things on the board. The cardboard components are heavy duty – as thick as the game board. There are two laboratories for each player, two invention player aids, some mechanical men tokens, arrows markers, and a Leonardo token and a Lord of the City token with plastic stands. Each of these look nice and are very durable. The Leonardo token is held by the player that acts first each round and the Lord of the City token… well it isn’t mentioned other than in the set-up. An actual error. The token is supposed to be used to highlight which area of the board is being resolved. The game also comes with 3 decks of cards: two mini-European sized decks that make up the money and resources and one standard-American sized deck for the inventions. The resource cards are color coded and have symbols on them so they are easy to read. The Florin cards are adequate, but color coding these would have added a little more appeal to them. They did color code the 5 zero florin cards – one for each player to use for bluffing – so they had the ability and chose not to do the rest of the cards. The backs of both sets of cards have a self portrait of Leonardo, a nice touch. The invention cards contain all the important information needed for the players: how many weeks it takes to invent, what resources are needed, the invention type and the value of the invention. I really like these cards. The backs have a sketch of Leo’s Vitruvian Man. Sketches of each invention on the card fronts are made to look like they were done by Leonardo. The name of the invention, which really isn’t important to game play, is written on the card in Italian. But I’m happy to say they have a list of the invention names in English in the instructions. I generally look these up so I can proudly announce when I’ve just finished work on the Automatic Hammer (top right) or Burning Mirror (bottom left). Speaking of the instructions, I’m not sure if they were written poorly to begin with or much was lost in translation or some of both. I will give them credit for the illustrations and examples in the instructions as these which definitely helped my understanding of the game. However, it took me a couple of read throughs and a solo play to figure out the basic game play. After I played, I hit up Board Game Geek to find the answer to a couple of questions and found out I played incorrectly. The game is actually fairly straightforward, but the instructions just don’t quite convey the simple mechanic. Important: you cannot take a mechanical man and save it to place later! So one section seems to imply the mechanical man is placed like a worker and another states the opposite. Fortunately the designers put out an FAQ which addresses this and other issues. Overall, I felt like they paid extra attention to detail in some areas: insert, invention cards and card board quality, but missed the target on others: art on the game board, box quality and rules. However, I think the pros out weigh the cons for the components. Leonardo da Vinci is well worth the $10 I spent and not only for the components; the game is enjoyable too. 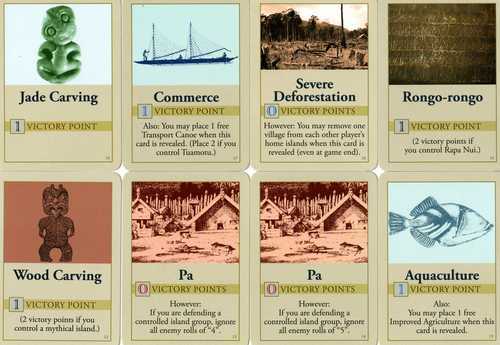 I first saw images of Tobago posted on BoardGameGeek and I instantly had to learn more about this great looking game. Tobago is a treasure hunt game. Each player narrows down the location of any of 4 possible treasures on the island. Once it is found they drive over in their ATV and raise the treasure. It’s been a hit with everyone I’ve played with and, like I’ll explain, looks great. The box is of standard quality and does the job. The cover art shows an Indiana Jones-like character and his companion hunting for treasure. It gives a feeling of adventure. Inside the box is a plastic insert that holds all of the components – most of them neatly in place. There is a spot for the amulets, palm tree and statue tokens, cards and board. My only complaint with the insert is the large bin that holds the rest of the small bits and tokens – which there are a lot of and need to be sorted each time you play. I highly recommend picking up 8 little plastic bags to store the 4 player and 4 treasure tokens in separately. The board is actually 6 pieces: three double sided sections of island and three clamps. This allows for 32 different island layouts. The clamps do a nice job of holding the board together and also serve as a place to set the cards and amulets while playing. The island itself is made of hexes that are broken into different terrain types: lakes, mountains, jungle, etc. Most of the hexes are very simply done with just a few little details, like shells and crabs on the beach, that add some interest. The set-up guide is clear and concise. The rules on the other hand are cluttered. There are plenty of examples of game-play and diagrams of how things work, but these immediately follow each basic action and make the game seem more complicated than it actually is. The first page could have simply listed the basic rules and actions while the other pages cover them in more detail with examples. There are two small decks cards. The clue card deck consist of symbols that show where the treasure can or cannot be. In the image above, the top left card shows the treasure is not in a lake while the top right tells us the treasure is within 2 hexes of a statue. The other deck makes up the treasure. Each card has a certain victory point value, from 2-6, except two curse cards. The meaning of any card can be determined clearly from the effective illustrations. Site Markers:These are small wooden blocks of 4 different colors: black, gray, white and brown. These are used to note the possible locations of each of the 4 treasures on the map. ATV: The all-terrain vehicle (or ‘jeeple’ as I’ve seen it called) is the player token. These wooden tokens have been painted in four bright colors which are easy to distinguish. There is a windshield and front grill painted on the ATVs which give them a great look. You can’t help driving these around the island as if they were actually traversing the terrain. Huts: These along with the palm trees and statues act as additional landmarks in the island. Simple, wooden, brown shapes, but effective. Palm Trees: These are great tokens. They are wood and carved beautifully. Notches in the trunk give it texture. The details in the palm leaf make the trees come to life. Statues: And the best token in the game are the statues. As well as being another landmark, the gaze of the statue is where amulets wash ashore to the island. These are ceramic and give the statue weight. The texture and color make them feel like they were carved from stone centuries ago. Other than a few minor criticisms of the rules and storage, this game looks amazing. The game is fun to play, but I think part of the appeal is the great game components. They make the game fun to look at the get your hands on. 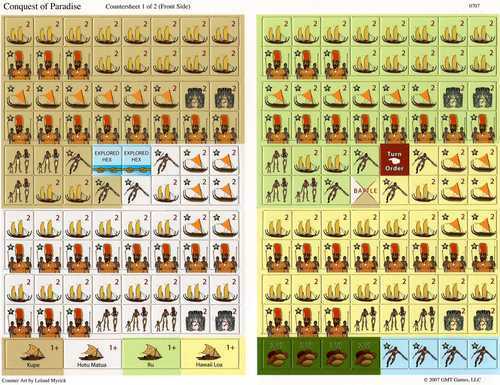 Conquest of Paradise is a light game of civilization building in the Pacific Ocean circa 500 A.D. I first played it at the 2009 WBC, when the designer, Kevin McPartland, introduced it to a small group of us. I really enjoy this game’s exploration mechanics, and managed to pick it up for $16.00. The contents of the game. The box is sturdy and appealing, boasting a textured linen finish very different from GMT‘s usual high-gloss finish, and a beautiful painting of a Polynesian canoe. The back of the box shows off a few of the counters and boasts that you can “learn in 15 minutes and play in 60-90.” Now I learned how to play this game in 15 minutes, but that because the designer was teaching me. A player’s Movement and Battle Step may begin with a Transit pre-move. If you have a Transport Canoe Chain, you may move as many of your Playing Pieces (Colonies, Warrior Bands, Transport Canoes, War Canoes, and Rumors) along it as far as you wish. Transport Canoe Chains have an unlimited capacity during Transit. However, any Transport Canoes serving as part of the Chain may not themselves move during this stage. A Transport Canoe Chain is simply a line of FACE UP Transport Canoes, with one Canoe in EVERY hex..(p. 5). In the example above, the term “Transport Canoe Chain” is used before it is defined, which leaves the reader wondering, “Um, is this going to get defined?” Only a few sentences later do we learn what the heck it is. The designer’s handbook is pretty neat, however; it gives a concise explanation of every island and event in the game and how they are important to Polynesian history. One thing sorely lacking in all this is an extended example of play, though. The four player aids are printed on thick paper in black-and-white. They’re functional, but don’t draw the eye at all. Last, it seems there were a few items left out in the original print run because GMT’s Web site includes updated PDF copies. 27 “Arts and Culture” cards come with the game. These are standard GMT fare: an eye-catching, glossy back and clean text with functional illustrations on the front. I immediately put them in protective sleeves, as the glossy finish tends to get nicked and start to come off after a few shuffles. The game comes with two sheets of square cardboard counters (310 counters in all), and two sheets of large hexagonal cardboard map tiles. The map tiles are easy to punch out, hanging loose like Settlers of Catan tiles, but the square ones require more care. In my copy, they did not punch out easily, requiring the use of a thin box cutting blade and a nailclipper to cut off hanging corners. It was a pain, but I’ve had similar problems with some other GMT games. The art on the counters themselves is adequate, but not beautiful. One gripe I have is that the green and yellow players’ chits are so light in tone as to be almost indistinguishable except under bright direct light. This will cause problems for players with poor eyesight (like myself). One half of the game's counters. 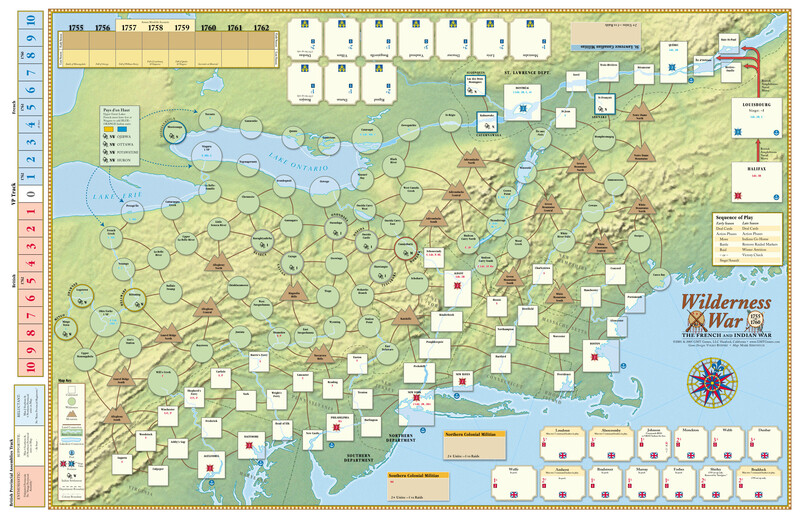 The map itself is thick cardstock along the lines of the original Twilight Struggle or Commands and Colors: Ancients board; it’s functional, but won’t grab someone’s attention from across the room. It requires the use of Plexi-glass or a poster frame, with the hexagonal map tiles laid on top. Overall, I’d say the components are pretty middle of the road for a war game, and that Euro gamers will be a little disappointed with them. All the colors on the pieces and map are slightly washed out, when you’d think that a game about the Polynesian islands would be full of lush vegetative greens and deep ocean blues. For $16.00, I can’t complain too much, however! The rules are short (though a bit difficult to read) and the game itself is pretty simple. Whatever small complaints I have with the components, I’m looking forward to sending out my canoes full of colonists and warriors and conquering paradise. I think it was the attack helicopter on the cover that caught my attention. The Hind made the 10-year-old GI Joe-collecting boy in me go crazy. So, if I sound a bit excited when describing the tanks and helicopters in World at War: Eisenbach Gap, I hope you can forgive me. The box itself is very appealing. It constructed of white cardboard and the printed cover is subtly textured. The benefit is a box with the resiliency of a glossy cover without the glossy look. Lock ‘n Load Publishing claims it’s beer resistant, but I haven’t tested that. Something about wasting beer and risking my signed box cover doesn’t sit well with me. The box is also large enough that expansions like Death of the 1st Panzer easily fit inside. One last comment about the box; I love the artwork. The old photos are subtly manipulated with color to create a high contrast piece that really works well. 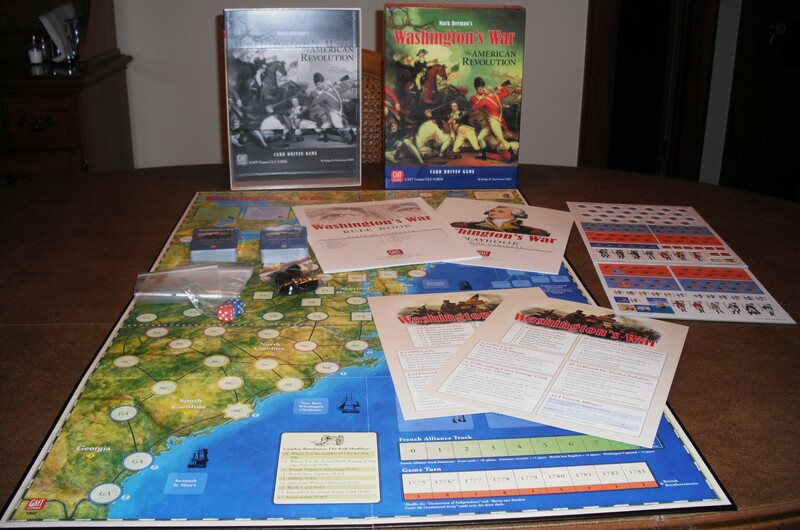 Inside the box, there is a letter from Mark H. Walker–the game designer and publisher–rule book, two player aids, four dice, two sheets of punch out counters, and a mounted map. The letter is one of those personal touches that I always appreciate. Mark vouches for the the game and asks for any feedback you may have. He also hopes you have great fun with the game. The rule book is printed on fairly think paper with a heavy-stock semi-gloss cover. Despite only having ten pages of rules and six scenarios, the rule book feels solid. It definitely is something you can open, pass around the table, and know it isn’t going to fall apart. Inside, illustrations are kept to a minimum. They consist of blow ups of the counters for reference. Any ONE unit within range of a helicopter, […] can opportunity fire on the helicopter after the helicopter conducts its attack, but before the damage is assessed. Both units […] then assess the damage simultaneously, allowing them to destroy each other in a true Hollywood moment. However, I have two complaints about the rule book. First, there is no example turn. The game doesn’t necessarily need it, but it is always helpful when learning the game for the first time. And, second, it doesn’t give a counter manifest. Considering the number of games out in the World at War series, it would be nice to know which counters belong to which game and know you haven’t lost any. 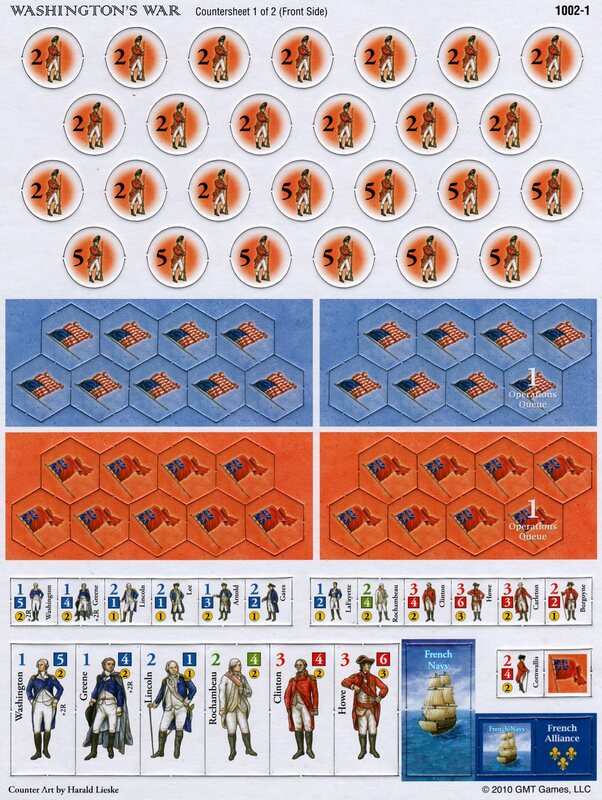 The two player aids are double-sided and printed on the same heavy-stock, semi-gloss paper as the rule book cover. On one side it lists all the terrain modifiers. The other lists moving fire modifiers and helicopter line of sight. The tables are big, easy to read, and use shaded rows to good effect. The only thing I would add to the aid is a sequence of play chart. Also inside are four squared-edge white dice. There’s not much to say about the dice. They are of standard quality and get the job done. However, it would have been nice to see two more. There are enough situations where six dice are rolled in one attack or defense that the extra two would have been really handy. According to Board Game Geek, there are 136 5/8″ counters. I haven’t counted them, but it sounds about right. Here’s where the artist, Olivier Revenu, deserves a pat on the back. The counters are great to look at. The AFV (armored fighting vehicles) are surprisingly detailed without being messy looking. The numbers, despite being small, are easy to read in part because they are outlined in a contrasting color. The counters are double-sided. There is a full-strength side identified by a tan band and a reduced strength side marked by a white band. The contrast between the two is great enough a player can tell unit strength at a glance. And despite being red-green color blind, the Soviet red and American green is different enough I haven’t had any problems telling the two apart. Still, the counters aren’t without fault. The game could have used more status and artillery markers. I hear this problem has been rectified in Blood and Bridges so at least it is good to see a publisher learning from past mistakes. Also, punching out the counters can tear at their corners slightly. If I get another World at War game, I’ll use an Exacto blade to score or cut through the corners to get cleaner counters. As it was, I just used a finger nail clipper to clean up the counters and they look pretty good. The last item in the box is the mounted map and it is great. The board that the map is mounted on reminds me of a very dense foam board. It creates a thick, stable playing surface–no need for a sheet of Plexiglass to cover the surface and hold it flat. The terrain is easy to identify and, except for the shadows that point to the Southeast, instead of Northeast, (this is the Northern hemisphere after all), it is very attractive. My map did have one flaw. There was a thin streak of what look like dried adhesive, creating a line in the open plains South of Eisenburg. I tried rubbing it off, but just removed some of the green ink instead. Fortunately, the printing flaw and my rubbing don’t affect the ability to use the map in play. Overall, I’m very impressed with the artwork, design, and production values of World at War: Eisenbach Gap. Opening the box and setting up the game has made me excited to command infantry, tanks, and helicopters in a 1985 Cold War gone hot.